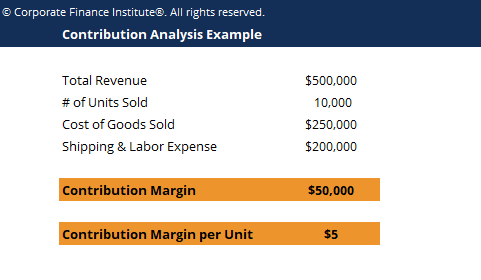 This contribution analysis template helps you calculate the total and per unit contribution margin. Contribution analysis is used in estimating how direct and variable costs of a product affect the net income of a company. The study addresses the issue of identifying simple or overhead costs related to several production projects. Contribution analysis aids a company in evaluating how individual business lines or products are performing, by comparing their contribution margin dollars and percentage. Direct and variable costs incurred during the manufacturing process are subtracted from revenue to arrive at contribution margin. This is, therefore, a very crucial procedure in the growth of a business. Contribution analysis aids a company in evaluating how individual business lines or products are performing, by comparing their contribution margin dollars and percentage. Direct and variable costs incurred during the manufacturing process are subtracted from revenue to arrive at contribution margin. This is, therefore, a very crucial procedure in the growth of a business.